A solar wind stream flowing from the indicated coronal hole could reach Earth on Oct. 19th or 20th. Credit: SDO/AIA. SOLAR FLARE! Sunspot 1112 erupted today at 1900 UT, producing the brightest solar flare in nearly three months. 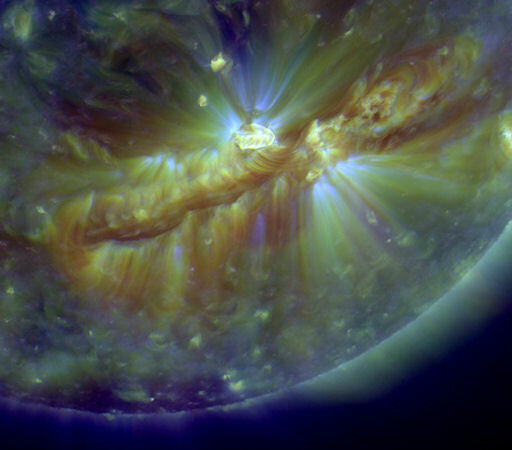 Click here to view a movie of the M1-class explosion from NASA's Solar Dynamics Observatory. A bright 'hot spot' just north of the filament's midpoint is UV radiation from sunspot 1112. The proximity is no coincidence; the filament appears to be rooted in the sunspot below. If the sunspot flares, it could cause the entire structure to erupt. UPDATE: Today's M1-flare did not destabilize the filament. Stay tuned, however, because sunspot 1112 is growing and more activity is possible in the hours ahead. Readers with solar telescopes are encouraged to monitor developments. TIME TO SEE COMET HARTLEY: For backyard stargazers, the next few nights are the best time to see green Comet 103P/Hartley 2 as it approaches Earth for an 11-million-mile close encounter on Oct. 20th. Set your alarm for the dark hours before dawn, go outside, and look straight up. You will find Hartley 2 not far from the bright star Capella: sky map. Although the comet is barely visible to the unaided eye, it is easy to find in binoculars and looks great through a backyard telescope. 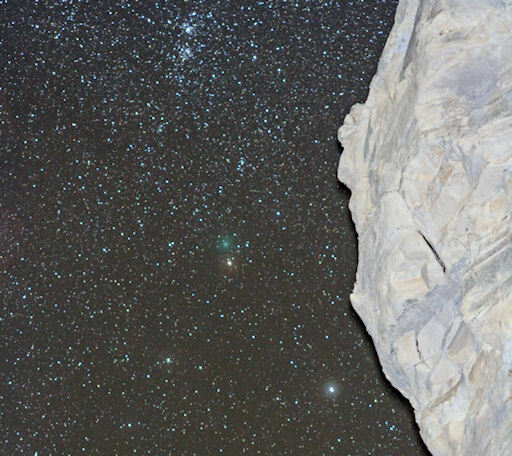 "To photograph the comet, I used a Canon Rebel XTi digital camera with an 85mm Nikkor lens," says Zubenel. "This picture is a single 2-minute exposure begun with the lens focused on the rocks, with a quick flash, then focus-shifted to infinity for the remainder of the time at ISO 800." NASA scientists say 103P/Hartley 2 is one of the most active comets they've seen; it has a big atmosphere and copious outgassing from jets in the nucleus. Amateur astronomers are encouraged to monitor the action and submit their images here. more images: from Rolando Ligustri using a robotic telescope in New Mexico; from Mike Broussard of Maurice, Louisiana; from Fredrik Broms of Kvaløya, Norway; from Tamás Ábrahám of Zsámbék, Hungary; from Efrain Morales Rivera of Aguadilla, Puerto Rico; from P-M Hedén of Vallentuna, Sweden; from Nick Howes using the Faulkes North Telescope in Hawaii. On October 16, 2010 there were 1155 potentially hazardous asteroids.